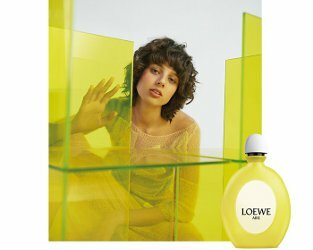 Spanish house Loewe has launched Aire Loewe Fantasía, a new citrus perfume for women. Aire Fantasía is a flanker to 1985's Aire Loewe. The most sparkling interpretation within the Aire LOEWE family. A younger bottle inviting to touch it, somptuous [sic] curve lines and the typical game of transparencies of Aire LOEWE. Its cap, as if it was suspended in the air, maintains the lightness of Aire LOEWE. An Eau de Toilette inspired in the original Aire LOEWE fragrance. The citric head is marked by the lemon, orange and grapefruit notes and the refreshing effect of the tangerine. An elegant and subtle heart thanks to a white flowers bouquet, composed by magnolia, lily of the valley and jasmine, common flower in all the Aire LOEWE fragrances. Its musk and sandalwood base brings warmth to the fragrance along with the green vetiver touch that gives character and body to this Eau de Toilette. Additional notes include almond blossom, neroli and benzoin. Loewe Aire Fantasía is available in 75 and 125 ml Eau de Toilette. I remember the original Aire way back when – acquired a sample (in a lovely miniature bottle) from Frasers department store, in those days we actually had a couple of decent department stores in Aberdeen! Very pretty perfume. I have never had easy access to Loewe & have never smelled Aire that I can remember – glad to hear it was pretty.